An Aesthete's Lament: Details Count: Fillet, Fillet, Who's Got a Fillet? I love the word, and I love the idea of it. I've seen it done beautifully in some of the historic houses I've toured. Such a treat to find you on my reader today. Love how you glide back in again. Banks-Pye was my introduction to fillet; he could really rock it. Oh yes, my fillet is super thin. Love the room and the fillet. Just one question: how would one dust in that room? The only time I tried this was in a small guest room in the country. It has a flowered Colefax paper and a green grosgrain fillet applied more or less as in the picture of Debo's new digs. The use of a fillet took a room that was architecturally bland and made it visually quite exciting. (It may have helped that the colors of the paper and fillet were related to the colors of an extremely large glass-fronted 19th century doll's house.) With windows on three sides, it's our most popular guest room. So glad you're blogging again. I returned from the antique market today and found you in my many emails. Yeah! The fillet used this way is new to me. Thank you for the education! Dear Aesthete, Ah, yes, the fillet. Beloved of John Fowler and his followers and always used by Nicholas Haslam. A room is positively naked without them and, as if there could be anything better, slips of mirrored glass are the icing on the cake. It is rather sad that Debo has left behind the cornices of Chatsworth since they are truly wonderful. I am not sure that the fillets of her vicarage can work the same magic. This is a great example of how even a a minor addition--if it's the right one--can make a major difference in a room. The drop-front desk is nice, as are the the maybe-Adam chairs & the pint-size Kentian mirror, but the room, fresh & pretty as it is, makes no pretence of of being anything grand. With the phone, ample wastebasket & foot mat--there to protect the rug from muddy shoes just in from the garden, no doubt--only inches away from the comfy chair where the inhabitant probably spends most of her day, this might be my own grandmother's morning room, not the room of one of the most dynamic & interesting women of the 2Oth century. That gilt fillet is what raises the whole thing to another level, but it does so discreetly. As for dusting such a charming room, DD probably has someone to do that for her, and if not, well, Mario Buatta said it best: "Dust is a protective layer for fine furniture." Ya gotta love the guy. Hope you had a good summer. We missed you. As with most things, it is all about the details. I love adding fillets to picture frames. They can dress up the simplest of frames. Great blog, what a joy! Does anyone have a source for the fillets that they could recommend? You know she has a new book out, right? "Wait For Me!" LOVE Debo! I noticed that comment too & was intrigued. Of course, that isn't the only thing I plan to copy from her completely GORGEOUS house - we're repainting soon & that beautiful bright green is going to grace our hall too, I think - I just love it. I highly recommend the Dowager Duchess of Devonshire's first book, The House. It's a room by room tour of one of the world's great houses, interspread with a similar written tour conducted by the so called "Bachelor Duke" (never married, intensly interested in interior decor, food, fashionable life, etc.- draw your own conclusion which his family never seems to have done, prefering to put him down as an unrequited womanizer which I'll bet he never was. I'm just sayin'...)in the 1850's. In the Duchess' marvelous account, she describes finding all manner of gilt fillet in the attics, storerooms and stables of Chatsworth which she then put to marvelous use. 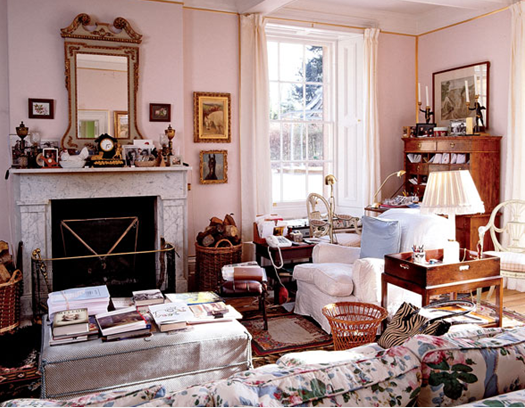 (See especially her sitting room and bedroom at Chatsworth, my idea of decor taken to a sublime height). For those of you interested, The current Duke is flogging a huge disparate group of superfluous goods and chattel at Sotheby's early next month. Check out the catalog on line. There may be some fillet for sale there. I love that very English looking room. The pink walls with gold trim are awesome. I've never heard that term before, but I love it. It has a really nice affect and highlights the lovely pink wall color. I think, for the best results, you have to have really high ceilings and tall windows for the fillet to shine. Toad, always seeing the fillets in custom framing, I had forgotten the use in room decor. It is a wonderful trim! Read the magazine and particularly about the Duchess , I love the house and the garden. And fillet, somehow it always reminds me of jewelry for the room. Oh I have this issue of The World of Interiors and bought it for this very article. I absolutely ADORE the comfortable, overstuffed elegance of the Duchesses' home. Thank you for such an interesting and informative post. This fillet idea is one I have never heard of before, but makes for a great accent piece around the room. I came across your post this afternoon while browsing interior design blogs and the topic of window treatment selection was very interesting to me. A fillet is a brilliant idea to dress up the outer space of a window. It is true that you must dress your windows appropriately to bring out their true beauty. Thank you for writing and as a special thanks to you and your readers, I would like to offer a 20% off coupon using this code upon checkout: BLG20.